It’s that time of the year, when the Oscars for digital luminaries takes place in New York City. 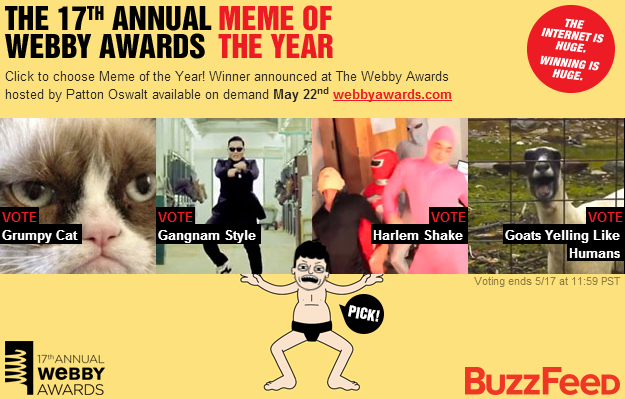 The Webby Awards have been announcing the nominees for its categories, and today the “Meme of the Year” awards were announced after careful deliberation by the Webbys and BuzzFeed. The four nominees are Grumpy Cat, the Harlem Shake, Goats Yelling Like Humans, and Gangnam Style. Three of the four don’t come as surprises for us – however Goats Yelling Like Humans was a pick we wouldn’t have expected considering that the meme was first published all the way back in 2007 and reached its apex in 2011. The winner is fittingly decided by you the audience. You can contribute your voice via a vote for your favorite “Meme of the Year.” You’ll have until May 17 to vote for a winner. The awards show is taking place on May 21 and on-demand the day after, with Patton Oswalt hosting and cameos by Jerry Seinfeld, Kevin Spacey, Grimes, and Frank Ocean. We asked Davies who he’s putting his money on, and his bet is on Grumpy Cat taking it all (ours too! ), but even he’ll have to wait until your votes are in before declaring the winner.